Endorsed on Seattle Radio Stations! 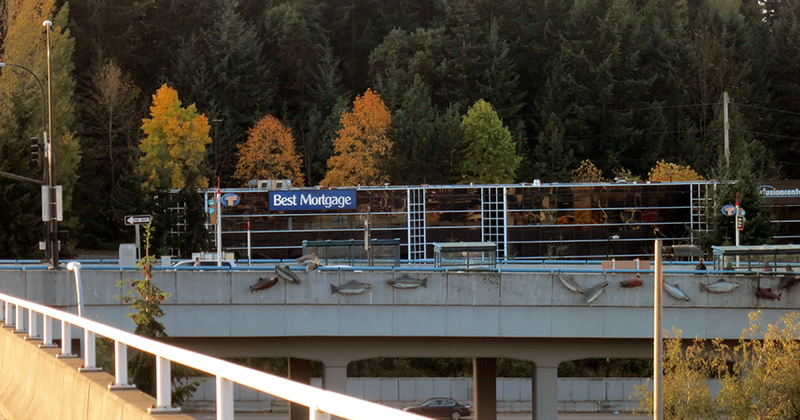 Best Mortgage Inc. is located at 14100 SE 36th Street, Suite 200 Bellevue, WA 98006. See below for specific driving directions from I-405 (North & South) and I-90 Westbound and Eastbound. 1) From I-405, take Exit 11 onto I-90 EAST toward SPOKANE. 2) Drive for 1.3 miles and take Exit 11-A/150TH AVE SE. 3) Stay in the far RIGHT lane of the off-ramp and when you come to the traffic light, turn RIGHT onto 150TH AVE SE. 4) Drive one block and turn RIGHT onto SE 38TH Street (gas station on corner). 5) Drive down the street, parallel to the freeway, for about half a mile. SE 38TH Street becomes SE 36TH Street. 6) Immediately after passing through the traffic light at 142nd Pl SE, look for a black glass building on your right (next to the freeway). You will see a sign that says "14100 Building " and "Best Mortgage" (see picture above). Turn into the parking lot. Park in any open parking space and come upstairs to Suite 200. 1) Heading EAST on I-90, take Exit 10B, for FACTORIA BLVD. 2) At the bottom of the off-ramp there is a traffic light. Drive straight ahead through the light. You are now on SE 36th Street. 3) Drive down the street, parallel to the freeway, for almost 1 mile. On your left, look for a sign that says "14100 Building " and "Best Mortgage" (see picture above). We are in the black glass building (next to the freeway). Turn into the parking lot. Park in any open parking space and come upstairs to Suite 200. 1) Heading WEST on I-90, take Exit 11 for 161ST AVE. S.E./156TH AVE. S.E./150TH AVE. S.E. 2) Keep LEFT at the fork in the off-ramp, continue straight ahead parallel to the freeway, following the signs to 150th Ave SE. 3) Turn RIGHT onto the circular on-ramp for 150th AVE SE , which takes you up onto the freeway overpass. 4) Continue across the freeway overpass and at the second traffic light you will see the intersection for SE 38th Street. 5) Turn RIGHT onto SE 38TH Street (gas station on corner). 6) Drive down the street, parallel to the freeway, for about half a mile. SE 38TH Street becomes SE 36TH Street. 7) Immediately after passing through the traffic light at 142nd Pl SE, look for a black glass building on your right (next to the freeway). 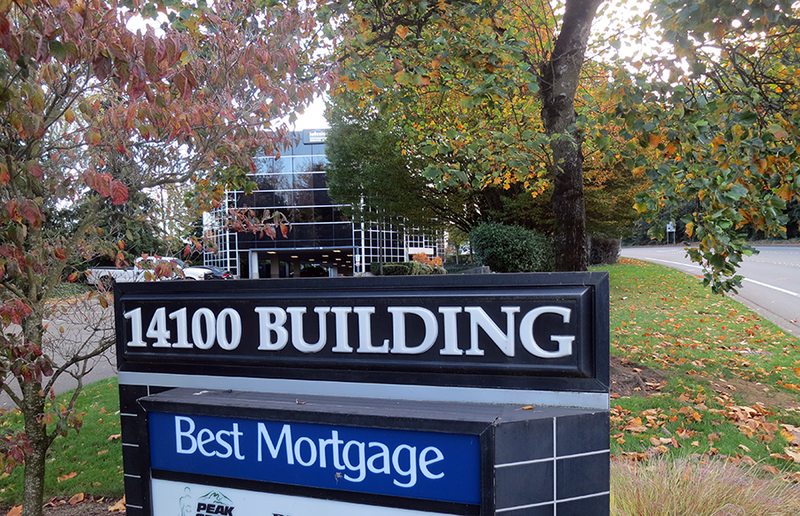 You will see a sign that says "14100 Building " and "Best Mortgage" (see picture above). Turn into the parking lot. Park in any open parking space and come upstairs to Suite 200. BestMortgage.com went online in 1995 as one of the very first mortgage company websites in the entire country. From the very beginning, our company philosophy has been providing "HONEST Advice You Can TRUST! "® In fact, that phrase and our company name Best Mortgage® are both federally registered trademarks of Best Mortgage Inc.
© Copyright 1995-2016 Best Mortgage, Inc. All rights reserved. Copying any portion of this website, including HTML code, without written consent of Best Mortgage, Inc. is strictly prohibited.